From the Peel Black Grace Cowley office continue up Christian Street, then take a right onto Church Street, at the stop sign take a left onto the A20, continue past Shoprite and Peel Clothworkers. At the round-a-bout take a right, then at the next round-a-bout take a left onto Clover Avenue. Take the next right onto Raad Bridjeen, follow the road round and take the 5th right onto Scoill Close, number 10 can be found a short drive down on the right hand side, clearly identified by our ‘For Sale’ board. Wood effect PVC door with glass central panel. Neutral Carpeted flooring, under stairs storage cupboard and stairs leading to first floor. Modern white suite comprising wash hand basin and toilet with concealed flush box, cream ceramic floor tiles and splash back. Fitted with a range of light Walnut effect base, wall and drawer units, cream marble work surface incorporating a one and a half bowl single drainer sink unit with mixer tap, Siemens oven, hob and extractor fan, cream ceramic floor tiles and cream marble splash back tiles, Gas boiler. Light and airy lounge with neutral carpeted floor, white PVC patio doors out onto the patio and large enclosed garden, TV and satellite points. Neutral carpeted floor, sizeable airing cupboard with shelving. Spacious double bedroom with views to the front elevation and surrounding countryside, built in wardrobes with sliding mirrored doors, neutral carpeted floor and taupe roller blind. Spacious double bedroom with views to the rear elevation with neutral carpeted floor and taupe roller blind. Views to surrounding hills, neutral carpeted floor and taupe roller blind. Fitted with a contemporary white 3 piece suite comprising bath with shower over, wash hand basin and WC with concealed flush box, cream ceramic part tiled surround, mirrored storage cupboard, chrome towel radiator and taupe roller blind. 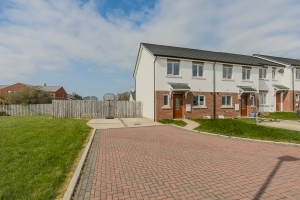 To the front of the property is a small garden mainly laid to lawn and 2 allocated parking spaces. To the rear of the property is a large enclosed rear garden with spectacular views to the hills and countryside. As this is the end of terrace property it is situated on a large plot and offers ample space for entertaining.